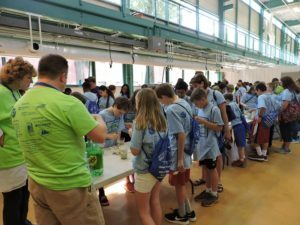 On May 18, 2017, more than 1,000 5th grade students from 16 Erie County schools hit the campus of Penn State Erie, The Behrend College, ready to learn everything water. They were joined by 210 volunteers and WSC staff as well as class guides provided by each school. WSC partnered with Penn State for the first Great Lakes Children’s Water Festival in 2015. Penn State took the lead to make this an ongoing event every two years. This is a great success, as we always hoped our festivals would continue in the areas where we have held them in the past. 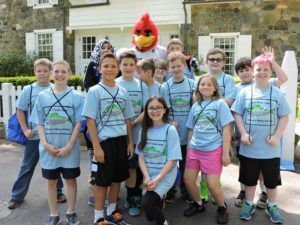 As part of our partnership, WSC used $24,000 from an EPA grant to cover the expenses of a new part-time employee who oversaw volunteer recruitment and communications with the schools. Some of these funds also covered bus expenses for schools that could not otherwise afford to attend. Throughout the day, students participated in 31 hands-on activities and presentations that focused on a variety of topics, including drinking water, groundwater, watersheds, surface water, water quality and conservation. The Edible Aquifers activity is always the most popular! Lisa Shola from Flexcon Industries (far left) looks on as students create their own edible aquifers. Edible Aquifers — this activity was one of the most popular, where hundreds of pounds of ice, gallons of vanilla ice cream and cans of soda were used to demonstrate how aquifers work. The layers of chopped ice, sprinkles, ice cream and soda might have been a stretch as replacements for porous rock, sand, gravel and groundwater, but they sure tasted good. 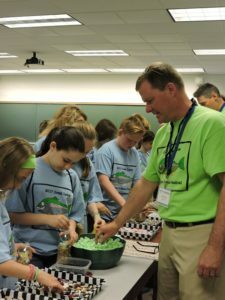 Bill Long of Goulds Water Technology, a Xylem brand, helps students make I-SPY bottles. I-SPY Bottle — the kids lined up to choose items to create their own personal I- SPY bottles. They filled empty water bottles with rice to emulate sand and added their chosen pieces – we had shells, sea glass, and jewels but also pop tops, plastic bags, foam, and other items that demonstrate pollutants in our waters. 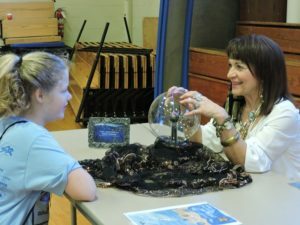 Alice Burton from Goulds Water Technology, a Xylem brand, tells a 5th grader her Water Fortune. Regardless of the activity, the central goal was the same: educate children about the importance of water. Mission accomplished! This highly successful event would not be possible without the support of our members! 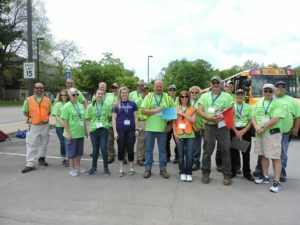 Thanks to employees of Goulds Water Technology, a Xylem brand, who oversaw the I- SPY activity that all 1,050 kids participated in, as well as to Flomatic Corporation, Flexcon Industries, Franklin Electric Co., Inc., and Milby Company for sending volunteers. Special thanks to Master Water Conditioning Corporation — to Larry Zinser for his oversight of festival security and to Richard Mest, who helped oversee coordination of the festival day. 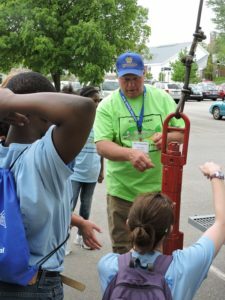 We also thank PGWA’s Ron Holt (above, explaining drill bits to students), who once again brought his drill rig to the festival and sponsored the backpacks for the students. To view additional photos from this festival, visit our Photo Gallery. Watch these videos to learn more about festivals! If you would like more information, please contact WSC Executive Director, Margaret Martens by Email or by calling 202-625-4387.